Our first interview with Dave “Pee Wee” Herman was in February 2009. He had just come off the very first loss of his career to Mu Bae Choi in Sengoku and decided he should probably take a few official MMA lessons somewhere. After talking with his manager, he ended up at Nashville MMA and that is where we met Dave through Ed Clay shortly afterward. Dave finished all of his first 15 opponents before Choi; 14 of them in the first round. All of Dave’s initial success came basically from him training at home, his athleticism and the couple of three years he wrestled in college. Once Dave started “officially training” he got back to his first round knockout ways and won his next three fights. In May 2010, he made a mistake, threw an illegal knee and lost via disqualification to Rameau Thierry Sokoudjou in a fight he was clearly dominating. Following that, he submitted Michal Kita via omoplata at Bellator 31, then scored the first decision win (unanimous) of his career against Yoshihiro “Kiss” Nakao at World Victory Road’s “Soul of Fight”. Dave then began traveling the country and testing out some different gyms. He also signed on with a new manager, Shu Hirata. In Spring 2011, it was announced Dave had signed with the UFC and he settled in at Team Quest in Temecula, Calif., for training. Dave made his Octagon debut this past weekend at UFC 131 against Jon Olav Einemo, a submission expert out of Golden Glory. After a back and forth battle that lasted just over three minutes into the second round, Einemo was left battered on the canvas and Dave “Pee Wee” Herman had just won his UFC debut. He was also awarded “Fight of the Night” honors and pocketed and extra $70,000 on top of his regular salary. 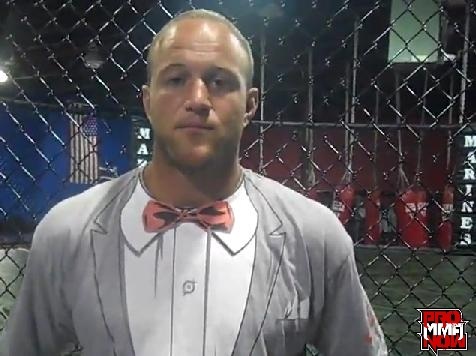 ProMMAnow.com (www.prommanow.com) caught up with “Pee Wee” on Tuesday to talk about the win, how he has improved since joining Team Quest, how he plans to spend all that money and why he thinks BJJ doesn’t work. One thing I noticed is your striking looked really improved. You looked really solid out there. How much of a difference has moving to Team Quest made for you in your striking? Have you had a chance to watch the fight yet? What did you think overall and what are some things you might have noticed that you would like to improve on? When you saw how big that guy was, did you get any nerves at all or does that not make a difference to you? You got a huge payday there. What was the first thing you bought with that payday or have you not had the chance to spend any yet? How motivating is it to know you can make that kind of money and more by knocking people out? I know in the past there’s been some issues maybe with motivation or whatever. Do you think maybe this is the thing that will get you really motivated, is making that kind of money? I think you made Dana [White] very happy. Did he say anything to you after the fight? Have you started catching any flack for the “BJJ doesn’t work” comments yet? I think I saw a Tweet from Renzo Gracie, said something. Did you hear about that? Why does BJJ not work? It used to kind of work, right? Can you talk a little about your wrestling background; you went to Indiana right? How does one walk onto a Division I school like that with really no experience? What was your sports background before that? Did you always stay active then, always into something? It really seems like your athleticism took you a long way in the sport to begin with. So, does wrestling work in MMA? Did you watch the other fights on the card? Did you see Beltran’s fight? What did you think of the main event? Yeah, it seemed like his hands were just too fast for him. So, what’s next, are you right back in the gym, you going to take a couple weeks off? Yeah I heard an interview where they asked if you wanted to drop to 205. Frankly, I had never even thought about that for you. You’ve had what like 23 fights at heavyweight now? It’s a little late to start thinking about that maybe. I don’t know. So, are you thinking of maybe beefing up a little? Look at the champ, he’s not a huge guy. Fight fans can keep up with Dave “Pee Wee” Herman on Twitter @DaveHermanMMA, on his Facebook Fan Page, and on his personal website www.DaveHerman.net.